Wheelchair Fencing started just after World War II by Dr Ludwig Guttmann as a rehabilitation technique. It appeared within the first Paralympics in Rome in 1960 and have developed since in popularity. It is for individuals with Cerebral Palsy, amputations and spinal cord injuries, and can be played in singles and/or teams. 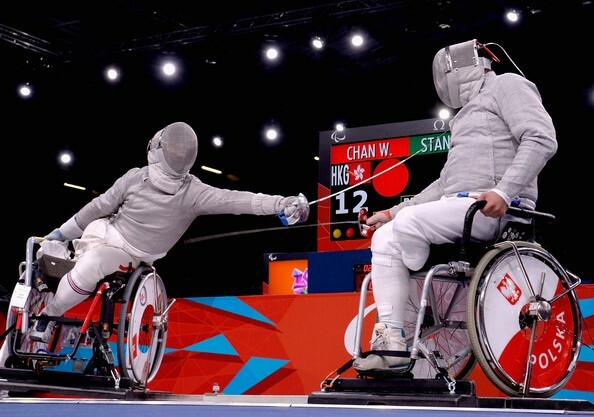 Within Wheelchair Fencing, there are three types of competition in which individuals can play in and two formats in which competition can occur in. The types of competition which can be played are classified according to the 3 different swords which individuals can use – sabre, epee and foil, where both competitors fight each other with the same sword. The format of a competition can occur as a team competition or as a single competition. Wheelchair Fencing can be played by individuals with Cerebral Palsy, amputations and spinal cord injuries. Whilst Wheelchair Fencing does not have a single class for individuals with Cerebral Palsy, Wheelchair Fencing does have pre-define rules on classification whereby individuals are classified by functional ability and movement. With classification going from the most effected to less effected, individuals with Cerebral Palsy will be put into a classification based upon their ability to do certain functional tasks.